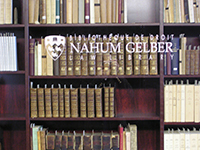 If you would like to know more about our facilities and services, we will be glad to offer you a tour of the Nahum Gelber Law Library. Half-an-hour tours are given to the groups of students (minimum of three) during our opening hours. You can send a request for a tour to the law.library@mcgill.ca Please do not forget to indicate the number of participants and your preferred time. Joseph Hémard (1880-1961), was in his lifetime one of the most prolific French book illustrator. His illustrations are the focus of the latest exhibit in the Yale Law Library, “‘And then I drew for books’: The Comic Art of Joseph Hémard.” The exhibit showcases eight of the 183 illustrations in Hémard’s Tax Code, donated to the Yale Law Library by Farley P. Katz, a tax attorney from San Antonio, who has one of the world’s finest collections of Hémard’s works, and other books from the Yale Law Library’s Rare Book Collection. You can find more information about the exhibit at the Yale Law Library Rare Books Blog. Legal researchers can now access on CanLII a collection of over 9,000 decisions of the Supreme Court of Canada dating back to 1907. These decisions are fully integrated and cross-linked to any subsequent case on CanLII in which they are referenced. The addition of a 1,600 cases ensures that CanLII users will have access to all judgments published in the Supreme Court Reports since 1907. More comprehensive collection of 1876-1907 cases can be found at the Supreme Court of Canada website. KeyCite Canada includes now three new judicial treatment types: Overruled, Considered in a minority or dissenting opinion and Referred to in a minority or dissenting opinion. You can find out more about them here. This collection of essays discusses the fundamental questions and the issues of the methodology of legal history research. The authors explore the approaches, methods, and sources that form the basis of legal research and illuminate the complexities and the challenges of researching into the history of the law posed by visual, unwritten, non-legal , and traditional archival sources. You can find more information abou this books here. This is the newest volume in the History of Medieval Canon Law series that gives a detailed overview of the history of Byzantine and Eastern canon law. Authors discuss the origin of canon law and the development of church order in the Early eastern Church, the corpus canonum before the Quinisext council, the Byzantine canons, and the imperial legislation and jurisprudence on church matters. You can find more information about this book here. The author uses records of Inquisition witchcraft trials in Venice to explore how different classes of the Venetian society understood characteristics and boundaries of nature and the supernatural. This work describes the complex forces shaping early modern beliefs a through their manifestations and evidence in the witchcraft trials’ records. You can find more about this book here. In medieval legal transactions the use of the written word was just one mean of communication among many other, e.g. the spoken word and the ‘action’ of legal ritual. This work discusses fifteen cases, ranging from the early Middle Ages to the eighteenth century, and from England to Galician Rus’. It is is volume 22 of Utrecht Studies in Medieval Literacy (USML), the series edited by Professor Marco Mostert. You can find a detailed list of the series’ content at their website. USML series is a forum for publications on the history of all form of communications in the Middle Ages, non-verbal, oral, and written. You can find more about this book here.